The Wooten-Riddle Team has built their business off of their community connections, knowledge of the industry and dedication to excellence and integrity! They continue to always provide the best service possible and between the two of them have 26 years of experience in residential (both existing and new construction), development, commercial sales and leasing, farming, investment and vacant land. The Wooten-Riddle team are excited to share their knowledge, passion and dedication to the real estate industry with each and every one of their clients. 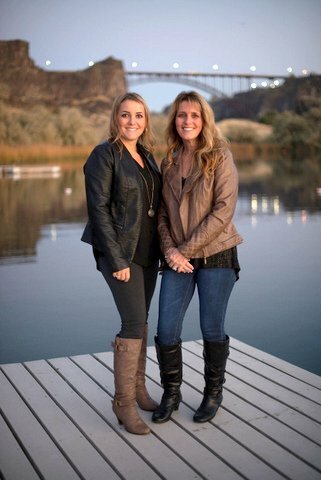 Tawni & Mandi are a mother/daughter real estate team who have been in the business since 2004 and in 2015 purchased the Berkshire Hathaway HomeServices Idaho Homes & Properties brokerage. Mandi is the designated broker of BHHS Idaho Homes & Properties and Tawni is an Associate Broker. Both believe in continuing education and have many designations behind their names. They believe that successful real estate transactions come about as a result of clear and open communication, particularly on the needs and expectations of their clients and the current market conditions. They take pride in their ability to work hard and approach each situation with an open mind. The Wooten/Riddle Real Estate Team specializes in property evaluation, pricing strategies, homebuyer representation, photography and home staging, marketing & advertising, relocation assistance, land development, commercial sales and leasing as well as farm and agriculture. Tawni and Mandi are known for their honesty, integrity and work ethic and would love to help you with your next real estate purchase.